Vampire bat venom could prove the key ingredient in future medication for stroke and high blood pressure after an international team of scientists identified ”a whole suite” of ways bats prevent blood from clotting. Led by the University of Queensland’s Bryan Fry, the researchers found three new types of anticoagulants and two new compounds that open arteries in the skin to increase blood flow. Discovered in the venom of the common vampire bat from Central and South America, Professor Fry said the compounds had significant potential for future drug design and development. Professor Fry said he was surprised to see how complex and diverse the venom was – one class of anti-platelet compounds had 50 different versions. Such variety makes the venom particularly efficient, as it is unlikely the animal being bitten repeatedly will develop antibodies to each of the 50 strains. The results, published in the Journal of Proteomics, also identified novel compounds which are yet to be fully understood. Professor Fry said synthetic versions of the compounds could be made for use in follow-up studies and ultimately drug production. He said some of the compounds could be longer-lasting or more potent anticoagulants than those used in existing treatments. ”It’s an exciting, new, rich resource,” he said. There are three types of vampire bats but researchers concentrated on the common vampire bat because it is considered the most evolved. 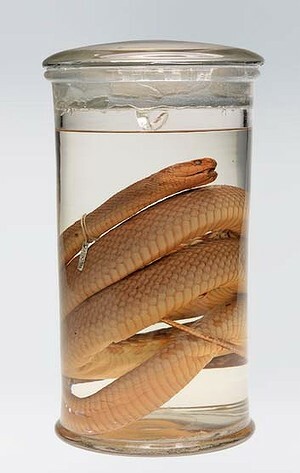 ■ Meanwhile: snakes, redback spiders, platypuses and jellyfish are among the creatures on display at an exhibition on Australia’s history of pioneering research into antivenom. The free exhibition, Venom: Fear, Fascination and Discovery, is on at Melbourne University’s Medical History Museum until July 20. See museum.medicine.unimelb.edu.au for more information. You are currently browsing the New Cures blog archives for June, 2013.